Democracy, good governance and rule of the majority have become buzz phrases. They are household terms in the contemporary international political arena. Unfortunately, in the context of Bangladesh, there appears to be a lack of consensus as to what they mean. The subjective interpretation of objective notions has led to absence of clarity and controversy. The idea as a whole has assumed greater significance given the importance that is attached today to the concept of good governance. It can no longer be kept confined within the corridor of a donor discourse. Its connotation has given rise to primary legal denotations. The paradigm has to be seen for what it is -- within the ambit of the existing political process. 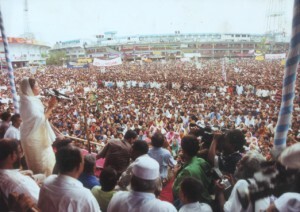 Thirteen years have passed since we did away with autocracy in Bangladesh. We are nearing the half-way mark of our third freely elected democratic administration. Yet, notions pertaining to democratic aspects of parliamentary practice continue to be debated at length. Representatives of political parties both inside the Parliament and outside, instead of constructive engagement have opted for confrontation. It seems that this erosion in parliamentary practice might have been hastened by a parliament where the current Administration has an overwhelming majority. This factor has had its own effect on the equation of parliamentary dynamics. The situation has indeed become most sensitive. Awami League which received more than 40 per cent of all votes cast in the last election feels that they have no voice within the Parliament. The Opposition as a whole continues to accuse the Speaker of being partial in his treatment of parliamentary opportunities. Charges are made that legal processes are being selectively applied to the benefit of the Administration in power. These are not helpful signs. Attention is also drawn to the fact that parliamentary committees have not been constituted in a bipartisan spirit. Consequently, questions are being asked as to whether parliamentary democracy as commonly understood is functioning properly and also whether confidence generated from the principle of absolute majority is harming the parliamentary process. Many critics of the contemporaneous situation are suggesting that the aggressive nature of our politics is increasingly acquiring a non-democratic character and that violence is becoming endemic. Newspapers in their issues of 20 December, 2003 reporting on remarks made by the Chief Justice of Bangladesh K.M. Hasan (in a seminar held the previous day on 'Breaking the Chains of Impunity: Human Rights Intervention in South Asia') highlighted the fact that the Chief Justice had come down heavily on the present parliamentary practices and indicated that 'little or no debate on important legislation or other mattes of national concern takes place in Parliament'. The Chief Justice in this context also made the following serious observations- 'the rising incidence of violence speaks of a culture of violence and intolerance being created and nurtured in the society more often than not by the nature of our national politics'. These comments appear to be an indictment on the effectiveness of the parliamentary dynamics. It also evokes the query as to whether the responsibilities that devolve with having a majority are being discharged properly. It is this perceived failure in assuring a healthy parliament and responsible politics that has encouraged the idea of a 'third force' and the 'Oikya Prochesta.' The protagonist of these initiatives claim that the present government is violating the country's Constitution and making the Parliament ineffective. It is also alleged by them that sick politics has been taking a heavy toll of the country's spirit of parliamentary democracy which the nation had achieved after great sacrifice. The party in power and the leading opposition party have both reacted with a degree of contempt to these new groupings. Yet, the very fact that they have come forth reflects the growing unhappiness of the common people. One is also tempted to think aloud as to whether assured majority in parliament and the latent constraints of Article 70 of our Constitution have encouraged parliamentarians of the ruling party to take their practice of democracy less seriously. Transparency International Bangladesh in one of their recent controversial publications, entitled 'Parliament Watch Report' has raised some interesting issues. They have underlined that on more than one occasion, the House did not sit on time due to (quorum crisis) the absence of parliamentarians during parliamentary sessions. They have also suggested that there was need for greater neutrality on the part of the Speaker in his conducting of business. The fact that several news stories also came out around that time about the Speaker and his Deputy not being on working terms did not help matters. The role of a majority in parliament is most exacting. It is difficult and has to be approached with a great deal of patience and understanding. It is important that the Members of Parliament belonging to the Opposition are given all assistance in being able to participate freely and meaningfully within the House. If necessary, efforts have to be made for a constructive engagement also in the Parliament Committees. This will assure credibility and encourage positive debate. Fundamental issues which have surfaced as national ills -- poor law and order, corruption, bad infrastructure, inefficient public administration, criminal nexus in politics, status of minorities -- need to be discussed in the House. As has been pointed out by many, debates should also be held on the deteriorating situation in the Chittagong Hill Tracts, the Indian attempt to inter-link rivers to the potential detriment of Bangladesh and the possible effect on our socio-economic sector after the phasing out of the Multifibre arrangement (MFA) in 2005. None of these things will however be possible unless the majority understands that democracy is a participatory process where the minority in parliament is as important as the majority. After all, in principle, the minority is the shadow government in waiting. We need to pause and identify why the credibility of parliamentary democracy is losing out of agitational politics. Is it because our parliamentary parties and their adherents are less than flexible? Is it because their internal structure is such that there is very little room for maneuverability for their members? Is it because there is hidden autocracy within the folds of the political parties which do not permit disgruntled members to openly voice their opinion? Is it because the parliamentary process of decision-making and accountability have become redundant given the absolute nature of majority within the parliament (where each Bill is certain to be passed without any difficulty)? These are pertinent aspects that need satisfactory answers. Democracy is not only linked with good governance but also with fair functioning of any parliamentary majority. Power emanates from the people. Their representatives and the government need to remember this. Article 7 of the Constitution refers to this clearly. If the parliamentary becomes dysfunctional, the entire country suffers. Instead of moving forward, we will regress. We just cannot afford to do that. I take this opportunity to draw the attention of the Government to the observations made by US Congressman Joseph Crowley on 14 January during his visit to Dhaka. He stressed that "democracy is the rule of majority, but the minority party's rights must be protected fully." He also decried the fact that whoever comes to power in Bangladesh "becomes the owner of everything and does not share anything with the opposition' (News Today, 15 January 2004). It is this that needs to be avoided. To consolidate democratic principles, the majority has to work with the minority in the Parliament. This alone ensures effectiveness of the democratic process. Muhammad Zamir is a former Secretary and Ambassador.